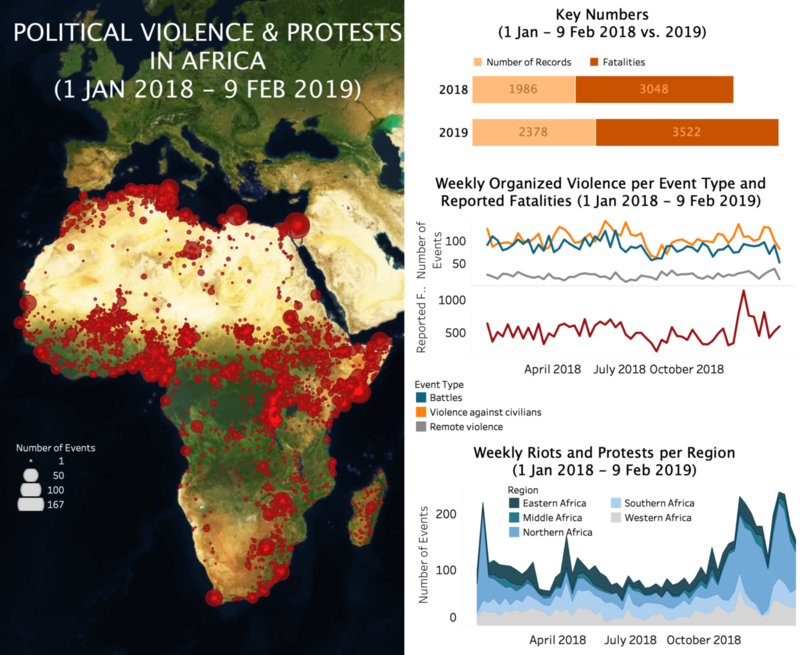 Key developments in the week of February 3rd include the heavy targeting of civilians in Burkina Faso, the instability along Libya’s border with Chad and within Libya itself, and the violence in Cameroon. Last week was particularly violent for civilians in Burkina Faso, who came under fire from various parties. On February 4th, the Burkinabe army claimed to have killed 146 militants in Kain (Loroum, Nord), Banh (Yatenga, Nord), and Gomboro (Sourou, Boucle du Mouhoun). However, testimonies suggest that those killed were civilians or suspects, and that they were extrajudicially executed. On the same day, soldiers reportedly arrested and executed an unknown number of miners in the area of Souma (Sahel). Extrajudicial executions by state forces have been reported on several occasions in the Sahel and Est regions since late September 2018 amidst a quick spread of militancy in the country. This includes 20 people killed in Petegoli village on September 24th, 2018 (Soum, Sahel) or the 12 in the Est region on January 12th, 2019. Meanwhile, presumed militants of the Group for Support of Islam and Muslims (JNIM) attacked civilians and schools in northern villages, and Dogon Dozos attacked Fulani herdsmen in Boucle du Mouhoun. In Libya, activity rose both along the southern border with Chad and in the East region. In the South, forces of the Union of Forces for Resistance (UFR) – a coalition of Chadian armed opposition groups – attempted to cross the border from Libya into Chad. This provoked nearly daily airstrikes in Chad’s Wadi Hawar area (Ennedi Est) between February 1st-6th by the Chadian air force with support from forces of the French Operation Barkhane based in Ndjamena, as well as on February 8th by the Haftar Libyan forces (LNA) in Libya’s Murzuq area (South). The airstrikes were reported to have significantly impacted the UFR force, with some surrendering to the Chadian forces. In addition to marking the first airstrikes in Chad by the troops of Operation Barkhane since its creation in 2014, the events also revealed the persistent opposition to the regime of Idriss Deby, in power in Chad since 1990. Elsewhere in Libya, instability continues. The LNA continued their operations against Tabu and Tuareg communities in the Murzuq and Ubari areas in the south: seven Tabu members were reportedly killed in an airstrike on Murzuq on February 4th, while eight died in clashes between the LNA and Tabu and Tuareg fighters three days later near the Sharara Oil Field in Ubari. In the East region, the LNA announced that it liberated Derna again after fighting the Derna Protection Force (DPF) in its last bastions in the Old Town. Fighting had continued sporadically in this part of the town since the LNA first declared victory in June 2018, with the Maghar area of Derna recaptured on October 31st, and new offensives launched in the Old Town since late December. Lastly, fighting was also high last week in Cameroon, as Ambazonian separatists launched a “ten-day lockdown” in the Anglophone regions to disrupt the activities of the National Youth Day planned for February 11th. The separatists clashed with the security forces in Limbe, Buea and Muyuka of Fako (Sud-Ouest), in Mamfe of Manyu (Sud-Ouest) and in Ndawara of Ngo-ketunjia (Nord-Ouest). Civilians were also targeted as part of the violence, and roads blocked by the separatists. At least 55 deaths were reported between February 4-8th in both regions. Meanwhile, Boko Haram militants continue to boost their offensive in the Extreme-Nord. The number of events involving the militants rose from 14 to 24 between December 2018 and January 2019 and the trend is set to continue. Last week, the militants attacked civilians in Logone-et-Chari and Mayo-Sava on six occasions, reportedly killing 14 civilians.